Small with poor egg laying abilities, the Fayoumi serves mankind as a research subject and ornamental. They lay two small cream colored eggs a week starting as early as four months of age. 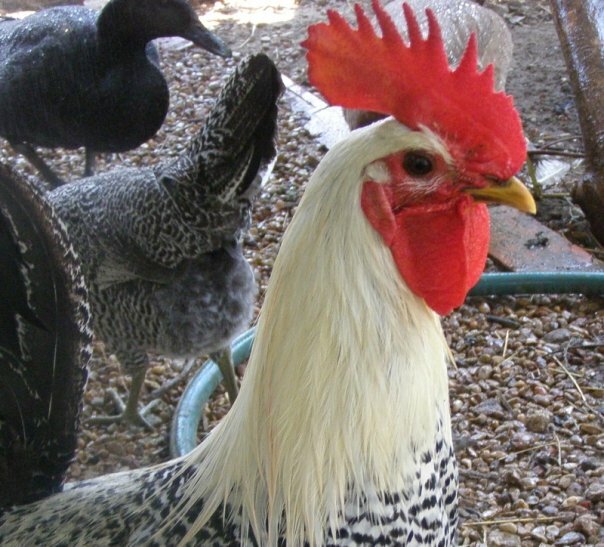 Fayoumi chickens mature quickly but only reach four pounds at full maturity. The breed shows remarkable resistance to viral and bacterial disease and infection. Owners refer to the Fayoumi chicken as the “escape artist.” They can really fly and love to forage when on the lam. Nearly wild, the Fayoumi goes feral if left too long on the range. They prefer to gather most of their own food. As pullets they have little broodiness, but a two-year-old hen will act quite broody. Tough, independent, and rangy the Fayoumi has little to recommend it as a domestic foul. Fayoumi chickens fail to fit into a backyard or suburban setting. They eschew confinement and will either escape or self-destruct. Once escaped they prove very difficult to capture. In confinement they pick feathers from themselves and others. Noisy in general, they will scream like a banshee when picked up by a human. The Fayoumi, a wild fowl, has an incredible awareness of its surroundings including predators. First-time chicken owners would do well to avoid the Fayoumi breed altogether, and experienced chicken farmers would do well to study the breed prior to making any commitments. Purchase Fayoumi chickens only if you live in a rural setting in the southern latitudes. If you plan on keeping them in a run, build high fences or clip their wings. Fayoumi prefer free-range food over commercial feed. Make their run spacious. They need territory adequate to their nutritional needs. Keep confinement to a minimum. Cull hens just prior to their second birthday to avoid the broodiness that sets in at that age. Fayoumi hens grow territorial over their nests. Provide plenty of nesting sites to avoid conflicts. Fayoumi chickens come from the Nile valley in Egypt. They came to the US in 1940 compliments of Iowa State University who used this unique fowl as a test subject. Fayoumi chickens have a unparalleled resistance to Marek’s Disease and many other avian illnesses. For obvious reasons, the Fayoumi chicken has little popularity in the US outside of research and has failed to gain entrance into the Standards of Perfection book as an officially recognized breed in America.